A week ago Friday I saw a listing on Petfinder for a dog in the local shelter who really caught my eye. Although Steve and I just cannot take on any more dogs ourselves currently, I felt I somehow had to save her from euthanasia. So I contacted the Franklin County Humane Society who in turn learned that Mitchell Mill Animal Rescue had retrieved this precious pup from the shelter. Steve and I agreed to help sponsor her since we couldn't realistically adopt her ourselves. We went out to meet her last Tuesday shortly after she was spayed - so she was rather sleepy and sedate that day. Today we went to see her again and take her some toys, and saw the Real Oodles! She is most likely a terrier/lab mix, is about 25 pounds currently and they think she is a young adult - I would guess maybe a year old? - so I doubt she is going to be much over 40 pounds at the most. 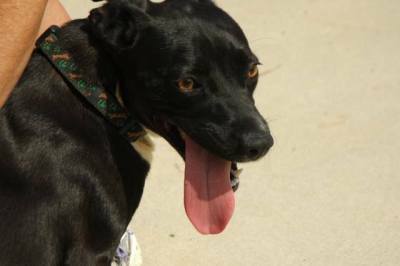 She is extremely high energy but also extremely loving and friendly, and good with other dogs and cats. She is playful and very intelligent, just Oodles of fun! My hope is that she will soon find a loving, caring forever home with people who can appreciate her charming and energetic personality. She is going to make some lucky family a wonderful addition. 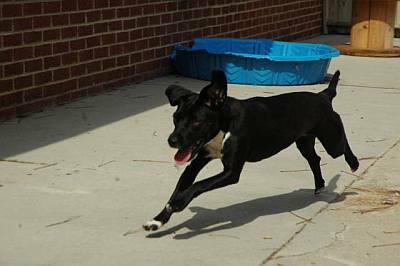 Adoption information on Oodles is available at (919) 266-8177.